You may have noticed a slightly lackluster post-rate on Ultra Culture last week. All that’s about to change now (sort of) because I’m back from Glastonbury (Thom & Jonny FTW) and raring to blog. My Glastonbury experience was entirely film-free this year (I learnt my lesson last year trying to watch Watchmen at 3am in the incredibly smoky ‘Cinema Tent’ amongst 500 people desperately trying to avoid the rain) but I was nonetheless intrigued by a few of the line-up highlights. 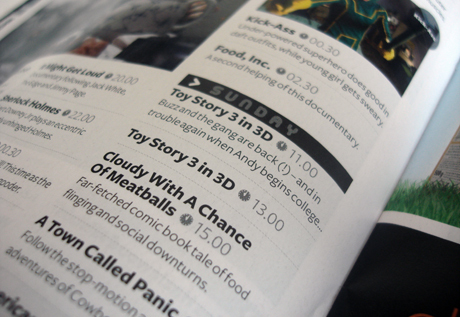 Most incredibly, they’d manage to score two screenings of Toy Story 3 in 3D, almost a month before its theatrical release. A few years ago Disney would never have dreamed of showing their biggest release in almost a decade to a room full of people with camera phones, so it’s nice to see them taking a few risks. I also like that the programme (pictured above) deems the return of ‘Buzz and the gang’ to be worthy of an exclamation mark… but only a bracketed one. Elsewhere, a preview of A Town Called Panic, showings of Exit Through the Gift Shop, Moon, Ponyo, Where the Wild Things Are and Shutter Island, and matinees of the entire Toy Story trilogy ensured that the line-up was superior to almost all actual film festivals, and all of it without an ‘NFTS Masterclass’ in sight.